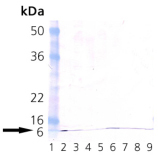 Application Notes: Detects a band of ~6.5kDa by Western blot. Scientific Background: Ubiquitin (Ub) plays a very important role in regulated non-lysosomal ATP dependent protein degradation. The protein to be degraded is conjugated to Ub and the ubiquinated protein is then selectively degraded by the 26S complex, a multicatalytic cytosolic and nuclear protease. The Ub-proteasome proteolytic pathway, which is a complex process, is implicated to be of great importance for regulating numerous cellular processes. Immunohistochemistry analysis of human brain, cortex tissue stained with Ubiquitin, mAb (P4G7-H11) at 5-10µg/ml.